President Trump has already started his reelection campaign for 2020 and he’s well on his way to raising a lot of money for the effort. Fortunately, candidates are required to publicly disclose campaign contributions to the Federal Election Commission, which in turn makes the data available to the public. This disclosure process includes where the donors work, allowing HowMuch.net to create our new visual. Zippia, a career advice website, gathered the data from the Federal Election Commission (FEC). Zippia analyzed contributions from employees at the 250,000 biggest companies in the country and found well over 30 million donations records from 2007 through 2017. We took the 30 most politically active companies on the Fortune 500 and ranked them in order of their campaign contributions over the last ten years. The bars represent the total contributions ($M) given to candidates in each party. We added the total figures and the percentage breakdown for Democrats and Republicans for easy reference. Several fascinating trends immediately jump out from our visual. First off, there’s a lot more blue than red on the graph, indicating that Democrats rake in most of the political cash from corporate America. Keep in mind that these contributions are coming from employees who work at these companies, not the corporations themselves. It’s actually illegal for corporations to make contributions directly to candidates. Republicans received more than 50% of the donations from only nine of the 30 companies, most of which tend to be grouped toward the bottom. Additionally, almost all of the bars include a tiny sliver of green, representing contributions to independent candidates. These contributions are there but they definitely don’t amount to much overall. Ultimately, it is fair to say that employees of these big companies have spent the bulk of their political cash on Democrats over the last decade. Let’s take a closer look at the top of the list. Financial institutions dominate the marketplace for political donations, making up six of the top ten companies. 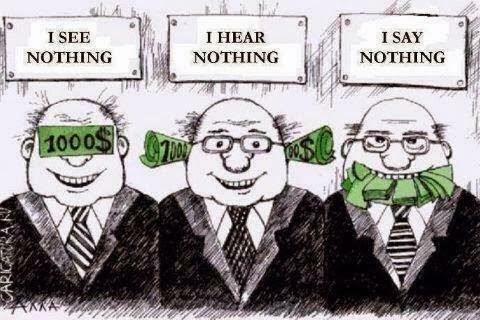 Goldman Sachs is in first place by a long shot, shoveling $11.5M to members of both parties. The bank’s money is split almost evenly across the aisle—possibly showing an effort to hedge against whichever party controls the levers of power. Charles Schwab provides an interesting contrast with Goldman in that the discount broker spends almost 70% of its political donations on Democrats. Microsoft and Apple also crack the top ten, but both companies clearly favor Democrats a lot more than Republicans, pumping 80% and 88%, respectively, of their political money into candidates on the left. Perhaps the most interesting fact about our visual is what it doesn’t show. Where is Walmart, the top ranked company on the Fortune 500? Or Berkshire Hathaway, McKesson, United HealthGroup, or CVS? What about other behemoths like Google or Amazon? Maybe their business models aren’t as reliant on politicians for their business models to work. 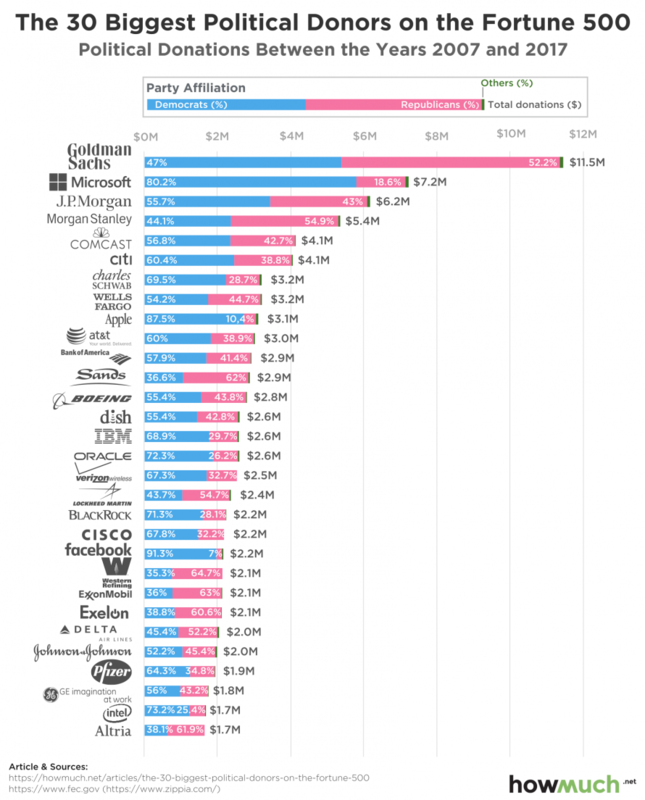 On the other hand, if so many major companies are missing from the list, why do employees at these particular companies spend so much on political campaigns? A new piece of legislation or a change in the regulatory environment could drastically affect the bottom line for big banks. Utilities like Comcast and AT&T are heavily invested in the ongoing debate around net neutrality. Other companies rely directly on government contracts for business, like Boeing and Lockheed Martin. In short, what’s a couple million dollars spent on a political campaign if it means the government will stay out of your way? Political contributions might be one of the smartest investments some workers can make for their own job security.